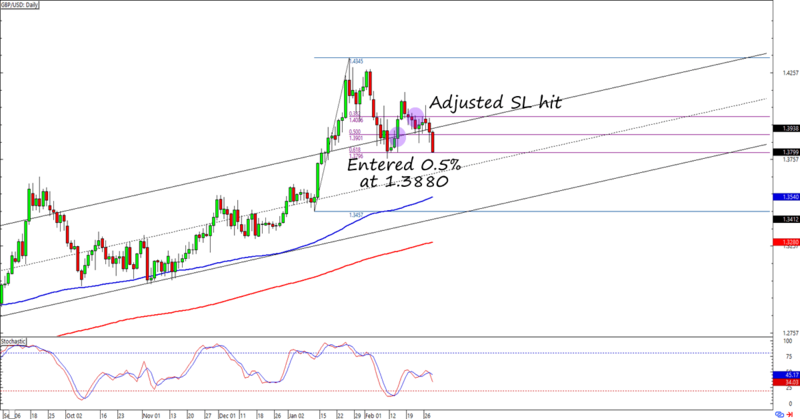 Long GBP/USD Trade: Adjusted Stop Hit! Looks like the dollar bulls are back…at least for now. Luckily, I was able to adjust my stop loss and catch a few pips before Cable REALLY gained downside momentum. In my update last week I told you guys how I jumped in at the earliest signs of bullish momentum after GBP/USD bounced from a Fib retracement AND a former rising channel resistance. But, just like my homegirl Jennifer Aniston and her (about to be ex?) hubby Justin Theroux, some things just aren’t meant to be. In my case, that’s GBP/USD’s bullish run last week. If you recall, the dollar got back some of the pips it had lost after the FOMC meeting minutes reminded everyone that the Fed is one of the more hawkish central banks out there. Add a bit of bargain-hunting and anticipation of hawkish remarks from Powell this week and we’ve got a fiesta for the dollar bulls. Meanwhile, it was getting hard to push the pound higher without fresh catalysts. It also didn’t help that top-tier reports from the U.K. came out mixed at best. Luckily, I was able to adjust my stop loss 200 pips higher from 1.3675 to 1.3975 when Cable broke above the 1.4100 handle. Pretty bummed that Cable’s uptrend had to end just when I decided to jump in. But hey, a few pips is still good pips, right? Right now I’m focusing on managing risk on my short USD/JPY trade. As mentioned in my tweet, I was able to enter at 107.50 last week. Let me know if you’re on this move, too! Will GBP/USD Keep its Uptrend Alive? If you like trading forex trends like I do, then you’re gonna love this uptrend continuation setup that I spotted on Cable’s daily time frame. Check it out! Jumped in on Cable’s Uptrend! Looks like Cable is ready for another bullish run! Here’s what I have for my forex trade this week. Looks like the dollar bulls are back…at least for now. Luckily, I was able to adjust my stop loss and gain a few pips before Cable REALLY gained downside momentum.